I shared the other day that we have started using Young Living oils and why, but today I really wanted to share some of the testimonies we have about using oils so far. For me, hearing what other people's successes had been was really helpful when we were trying to consider if oils were right for our family. Knowing what is tried and true for people I know and trust says a lot to me. Hopefully these testimonies I am going to share will. Disclaimer: All of the opinions here are my own and my family's. I am not a doctor and am not trying to give medical advice. I am ONLY speaking about Young Living oils, which we use and trust, so please do your research and be sure that you are confident in whatever essential oils brand you are using. Frankincense for Scarring My oldest daughter has a large scar on her arm from a burn. When I first got my hands on frankincense, the scar was fairly new. I am guessing about a month old. It was still quite red and very new skin there. 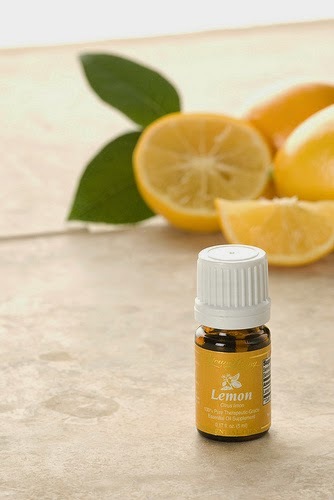 I started applying frankincense just one drop, once or twice a day and within a day or two I was noticing a difference. By 3 days, I was in shock! The photo speaks for itself. The photos are totally unedited, taken in the same exact place with the same lighting. The scar has faded considerably since then. After a few weeks of using frank, I just kind of forgot to apply it and the scar had really faded by then. I need to be diligent about doing it again to see if I can get it all the way gone, but it is the same color as the rest of her skin now. This was the first "ok, maybe these things actually work" moment we had. 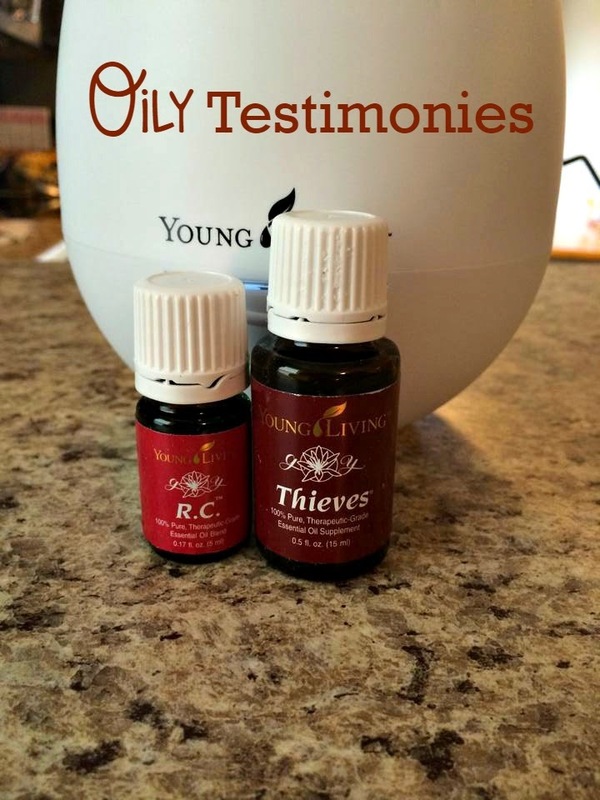 Thieves for the Flu Thieves is a great blend made by Young Living that has been university tested and proven to kill 99.99% of bacteria in the air. 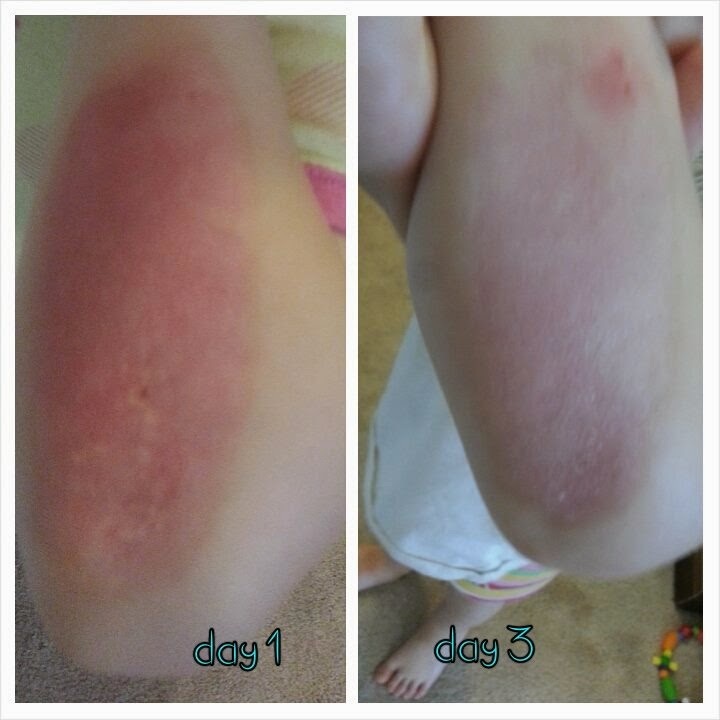 Needless to say, we diffuse it whenever we've been at yucky places like the doctor's office or play places, and I put it on my girls' feet before bed semi-frequently. We went through a bout of not really using it and I had never applied it directly to myself, and I came down with the flu. I will just say that I haven't had the flu in a good long while, but whenever I used to get it, I would be out for the count for 5-7 days. I'm talking holed up in my bedroom, no one touch me for the entire week because I'm so achy and miserable. I woke up with what I knew was the flu, and started diffusing thieves immediately. I put it on the soles of my feet 2 or 3 times a day. The first day, my husband had to go to work, so I diffused it in my bedroom right next to the bed and put movies on for my girls so I could rest. I really didn't want them to get it so I was diligent about diffusing it constantly that day. The next day was pretty much the same, but my husband took the day off so the girls weren't around me. The 3 of them put it on their feet once or twice each day and I used it 2 or 3 times the second day as well, still diffusing constantly. The third day I woke up and was fine. I could not believe it! No one else in my family got it, even though my kids spent the entire first day with me. Hallelujah!!! Thieves and Lemon for a UTI It was literally a day or two after my kit first arrived and I really hadn't dug into them at all yet. I had a series of urinary tract infections after my 2nd daughter was born that I just couldn't kick. I was getting one about every month until I finally started on a probiotic and I hadn't had one since (over a year)! Well, if you have ever had one, you KNOW when it is coming on. I went to the bathroom and knew in that instant. I immediately thought of my oils, because I really didn't want to drag both of my kids to the urgent care waiting room to sit and then wait another 24 hours to have relief kick in. I knew a friend had used oils for her UTI but I wasn't sure which ones and how she used them so I texted her, but she didn't get right back to me. I googled online and read that lemon is good for removing toxins and kidney function, so I dumped a bunch in my water and chugged. Once my friend texted me back (just an hour or two later), she told me that she did a drop of thieves in a spoonful of honey and had almost instant relief. I honestly didn't believe relief would come that quickly, so I downed the honey thieves combo (it will burn! ), and then ate some coconut oil to get the taste out of my mouth haha. I kid you not, within 20 minutes the feeling was completely gone. I did it again the next day, just for good measure to make sure it was really gone and it was and never came back. Lemon for Crayon Removal Oh, your kids don't color on the walls? Just mine? I can't even remember how it happened, but we were getting ready to go on a bike ride. My younger daughter drew a nice little piece on the wall between the bathroom and garage and I remembered someone telling me lemon removed it, so I put some on a cotton ball and scrubbed away. I won't say it was the easiest thing ever to get off...I had to put some elbow grease into it. But we have stark white walls and it was red crayon and you can't even tell it was there now, so.... Lemon for Cleaning I had burned some potato soup into a pot. It was bad. Really bad. At first, there were chunks of potato stuck to the pot that I couldn't even get off. I soaked it for a day, then scraped and scraped and scraped and soaked for another day and was left with the photo on the left. 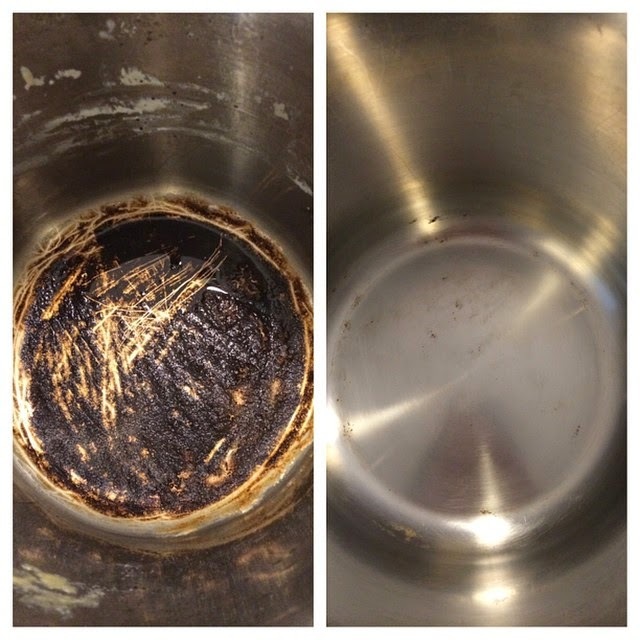 My husband suggested I try using lemon, but I was basically out. I shook the bottle for all it was worth and got 2 measly drops out, soaked it for a few more hours with the lemon oil in there and voila! Lavender for Restful Sleep One night, not too long after we started using oils, my husband was out of town. Because this kind of thing would only happen when he's gone. So my older daughter wakes up in the night, like an hour after I went to bed, of course, and I cannot get her back to sleep. This has never happened before. She's not sick, nothing is wrong, she just woke up and can't get to sleep. After probably about 2 hours of going back in every 15 minutes because she called me or I could hear her singing (she shares a room with her sister, and I didn't want TWO kids up at 3 a.m.), I finally brought her into my bed. Still couldn't sleep. Finally, out of nowhere, I remembered lavender! I took her potty and then brought her back to bed and applied a drop on the bottom of each foot. Within 10 minutes she was out like a light for the rest of the night! Thieves Toothpaste Last spring, I had to have oral surgery. About 9 years ago, I passed out at a water park and knocked one of my teeth out. I had a bunch of surgeries back then to put an implant in, and all was well until last year. I had noticed it was swollen there but not painful. I asked my dentist and they said it was fine. 6 months later, the next time I was there it was the same so I asked again and they did a little more digging and determined it was probably infected and sent me to a periodontist. He looked at it and agreed it was probably infected but there was no way to know unless they cut it open. I'll spare you all the disgusting details, but basically there was an infection because the bone there was wearing away so they took care of the infection, grafted in bone and brought my gums back together. While they were healing, the stitches split and there was a hole in my gum tissue. He said it should hopefully come back together on its own and it took awhile but it mostly did. When I went for a recheck after 2 months I think, he said it wasn't healing the way he wanted and if it didn't improve, he would have to do the surgery all over again. The surgery was painful and miserable and the recovery was pretty bad as well. I really wanted to avoid doing it again so I thought the thieves toothpaste may help. I started using it and I wish I had a picture. The gum tissue there after 2 months was still discolored and bruised looking. 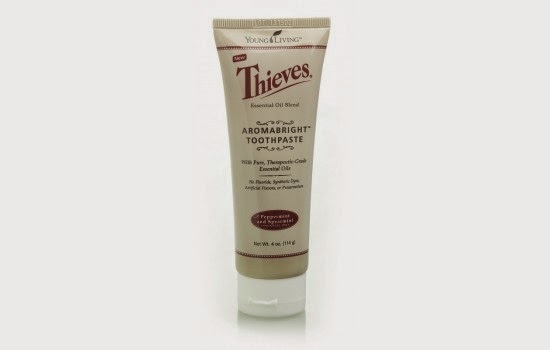 I started using the thieves toothpaste after about 4 months and used it for probably 1 1/2 months before my re-check. At the re-check he said it looked well and the color was what he wanted to see and I wouldn't need surgery again! I had stopped using the antibiotic mouthwash he gave me and was ONLY using thieves toothpaste. I had just added in the thieves mouthwash right before that appointment. We have definitely used our oils for more than just these things, but these have been our hugest and best testimonies when it comes to our oils. We have only been using them a few months and I already don't know how we ever lived without them! What is your favorite oil and do you have any good oil testimonies?! Question, what is the difference between young living oils and the oils you can buy at like hyvee? Wow! I can't believe the difference in your daughter's scar. I recently got a burn at work and while it's small, it's a bit annoying. I'll have to look into ordering frankincense.